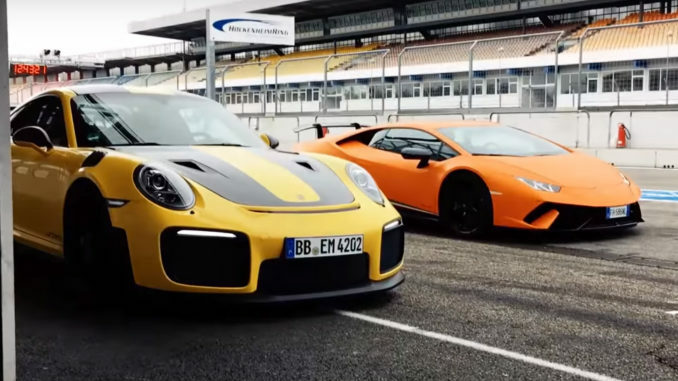 It’s the race we’ve been waiting for between the kings the ‘Ring: the Porsche 911 GT2 RS and Lamborghini Huracan Performante. They are the two fastest cars on the Nurburgring leaderboards in the street-legal production category, with the Porsche ahead by nearly five full seconds. What would happen if we take them away from the punishing ‘Ring and put them on a smaller, smoother track? German magazine Sport Auto did just that, pitting the two track monsters against each other in a head to head battle on the 2.8 mile long Hockenheimring. Check out the three minutes of exciting onboard footage, crazy-fast lap times, and wonderful exhaust notes to see who came out on top. Assuming you had enough to be choosing between a Huracan and a 911 GT2 RS, which car would you choose? Would the Lamborghini’s incredible 640 hp V10 float your boat? Or is the challenge of taming 690 hp to the rear wheels in the GT2 RS more your speed?